LONDON, March 21, 2019 /PRNewswire/ -- Africa's legal cannabis industry could be worth more than $US 7.1 billion annually by 2023 if legislation is introduced in a number of the continent's major markets, European-based market intelligence and strategic consultancy firm Prohibition Partners has found in its latest report, released today. The African Cannabis Report™ - the first detailed report on the legal cannabis industry in Africa, finds that the continent could reap significant rewards through the legalisation of cannabis. The report includes detailed market value forecasts, regulatory timeline analysis, consumption data and healthcare analyses for nine key markets, including Lesotho, South Africa and Zimbabwe. 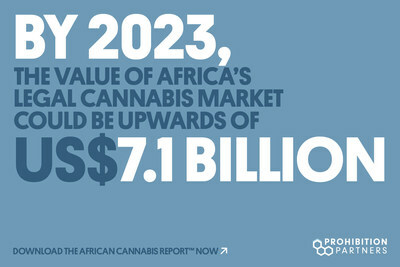 International demand offers a strong opportunity to unlock the potential value of Africa's legally produced cannabis, which could be worth up to $US 7.1 billion annually by 2023. Africa is home to five of the world's top 30 countries for cannabis prevalence among adult populations (aged 15-64) with over 76m users. Assuming there is full legalisation and regulation of the cannabis industry, South Africa and Nigeria potentially represent the region's two largest value medicinal cannabis markets going forward, worth US$667m to South Africa and US$75m to Nigeria by 2023. Should the law change, NGOs, charities and other donors who provide a significant proportion of the region's healthcare supplies will be an essential partner in providing access to legal medicinal cannabis products due to the inaccessibility of healthcare services. "A regulated legal cannabis market could be transformative to patients, farmers and economies across Africa. From a financial standpoint, Africa could reap significant rewards through the legalisation of cannabis, with international demand offering a strong commercial opportunity for cannabis cultivation. "Despite moves to legalise in several key markets, cannabis remains illegal across vast swathes of the continent as the great majority of African governments have yet to follow the trend of legalisation that is sweeping across Europe, North America and Latin America. "It is currently estimated that 38,000 tonnes of illegal cannabis is produced across Africa each year, with a market value of billions of dollars. This demonstrates the clear potential for an economic boom for African countries that actively seek to legalise and regulate their cannabis market." The report will be published on 21/03/2019, and can be downloaded on Prohibition Partner's website www.prohibitionpartners.com. Within two years, we have become the world's leading provider of market insights and strategic consultancy for this emerging frontier.